In Kyoto during the April 22nd -23rd weekend, local artists, community activists, students, architects, academic, etc are hosting two events for discussing on ‘what would you do if your income were taken care of’. Enno Schmidt from Switzerland and Ping Xu from Taiwan will be joining. Film screening, music instrument making, etc, are also planned. 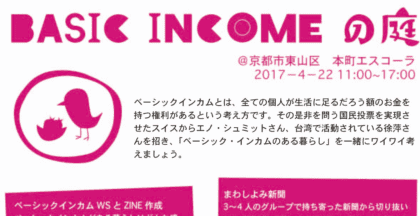 Kyoto Basic Income Weekend is a newly formed collective with local artists, community activists, etc. It is hosting this event with BIEN Japan, The Forum on Shrinking Society, Students at Toru Yamamori Lab, Doshisha university. Ping Xu is a liar, her crimes stained the honor of UBI. A lady from Taiwan, Lichan Tung, sued Ping Xu for Offenses of Fraudulence and Offenses of Embezzlement on August 22. This is Lichan Tung’s letter to Enno schmidt, which is published on Facebook. In this letter, Lichan Tung accuses Ping Xu of fraud. One should be responsible for the wounds that was cut by herself. If you still pity UBI Taiwan’s development, money should not be the focus, but the UBI Taiwan Team’s advancement and the training of elite talents, who will become the mainstream of UBI in Taiwan in the future. Xu Ping is now an unpredictable bomb for them. I don’t know what will happen next time. She changes faster than planned. It’s obvious to me that the thing she said last night is changing today. Her unstable personality makes people hard to prevent and proceed the plans. One of the examples: She said in front of everyone that she is going to the U.S. to push UBI and many people in the Silicon Valley support her. However, she said on the public website that UBI Taiwan pushed her out and said I used money to control her personal freedom (there are proofs and photos on her website). Second example: UBI Taiwan team spent only 70,000 TWD in Hualien. She even falsely reported over 200,000 to me, so I sent 200,000 more money to her. She admitted that but quibbled that I did not specify the use of the money for the team. There are so many facts I don’t need to repeat. Including her dissatisfaction with you and your lady’s vacation tour … you promised her to leave your wife and Hawaii’s Kris Lee liked her very much….. . I think it is ridiculous to think of it now. So I wonder if she has a dual personality. This is the reason why I have not yet sued her and published the messages against her. This is also my last kind of goodness for her. saying to this point, you should know what’s right and what’s wrong. I don’t need to explain to you again and again about the transfers of money. Will there be one person who will provide you with NT$700,000 unconditionally to provide you with a private tour of the country? This can really be “unconditional basic income.” It’s just too ridiculous. Tomorrow, I asked my son to meet her to get the laptop that I bought. It was really irritating. She went to Kaohsiung and lied to me and said that pushing UBI. She also had me to send 15,000 NT living expenses every month. During Chinese New Year, she said that her younger brother had no money. I sent her 30,000 to her, that’s all I had gotten. She went to Japan and had no money to stay at the hotel. She used the name of promoting UBI Asia Pacific Conference and inviting guests to come to Taiwan as the reason to ask me to send money to her? I did it, too. How did she repay me? She is an ungrateful woman. She has no qualifications to talk about social movements. It’s shameless of her to speak on behalf of UBI Taiwan. Therefore, I had no choice but to peacefully ask her not to use the name of UBI Taiwan (Mandarin title) if she wanted to establish an organization, so that she won’t fraud others by the same means to foul UBI Taiwan’s reputation. I don’t really want to say anything more by this point. That would only bother more people. I just want her to conduct herself well. It’s immoral to use the name of UBI for the sake of her own interests and power, even if she’s a famous figure in the world. This picture is one page of the bill of complaint.